Iraq War 10th anniversary: Mistakes were made. 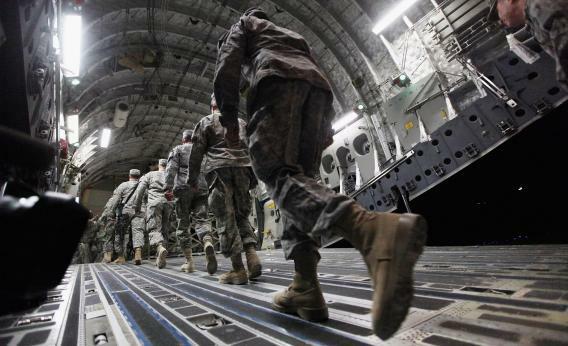 Soldiers from the 3rd Brigade, 1st Cavalry Division board a C-17 transport plane to depart from Iraq at Camp Adder, now known as Imam Ali Base, on December 17, 2011 near Nasiriyah, Iraq. The administration’s top budget official estimated today that the cost of a war with Iraq could be in the range of $50 billion to $60 billion, a figure that is well below earlier estimates from White House officials. In a telephone interview today, the official, Mitchell E. Daniels Jr., director of the Office of Management and Budget… would not provide specific costs for either a long or a short military campaign against Saddam Hussein. But he said that the administration was budgeting for both, and that earlier estimates of $100 billion to $200 billion in Iraq war costs by Lawrence B. Lindsey, Mr. Bush’s former chief economic adviser, were too high. - “White House Cuts Estimate of War With Iraq.” Elizabeth Bumiller, The New York Times, December 31, 2002. A study by Brown University’s Watson Institute for International Studies finds that the war has cost $1.7 trillion so far, with an additional $490 billion in benefits owed to war veterans. Those costs could grow to more than $6 trillion over the next 40 years, the report concluded. - “Iraq War Cost: $6 Trillion. What Else Could Have Been Done?” David Lazarus, The Los Angeles Times, March 19, 2013. Mitch Daniels went on to become a two-term governor of Indiana, courted by conservatives for a possible presidential run that could focus on “conservative common sense fixes” to our ills. He’s now President of Purdue University, where he’s just cut back on teacher pay. Plenty of journalists have used this anniversary, 10 years since the invasion of Iraq, to reflect on whether they got it right. I wasn’t a professional journalist at the time—I was a 21-year old college student—but I found a way to absolutely get it wrong. My mistake was to believe the official stories of Iraq under Saddam Hussein and of the Bush administration’s plans and cost estimates. The lesson I took away from this? Never trust these people. Never trust official estimates. Always question the agenda behind any government campaign.